LINZ. Only five more days until the opening of the 8th Fistball Women’s World Championship in Linz. For the first time we have 11 nations participating in the Championship, which makes it the biggest in history. Reigning World Champion Germany, Brazil, Austria and Switzerland are among the favorites quartet. Team Austria completes professional preparation under coach Christian Zöttl and is well equipped for the home World Championships. A fistball party is awaiting the spectators and fans. More than 3,000 tickets have been sold for the ÖBV Arena, tickets are still available at the box offices! 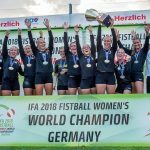 “With IFA, Faustball Austria, Upper Austrian Fistball Federation and FBC Linz-Urfahr four clubs joined together for the World Championship. There is a lot of work and passion in this major event. We are pleased to welcome the best teams in the world and promote our sport with great pictures and videos” ,says OC President and IFA President Karl Weiss. “In ticket pre-sale more than 3,000 tickets were sold. Especially Friday and Saturday are heavily frequented. We recommend to secure the ticket sale online before the sale price”, OC general secretary Christoph Oberlehner. Tickets are still available online on www.fistballwwc.com. The most convenient way to reach the entrance by public transport (Tram Stop – “Universität”). “We carried out our team training camp in Faak and in Linz. The organizational team fulfilled all wishes and provided perfect conditions,” says team player Katharina Lackinger, looking forward to the start of the World Cup. On Tuesday at 13:45 o’clock Team Austria enters the tournament against Belgium, at 17:30 o’clock follows the official opening ceremony, followed by the top match Austria vs. Brazil. “For us, a good start into the home WC is important. We have two tough opponents in the group with Brazil and Switzerland. We are very well prepared and want to reach the Gold Medal Match. Becoming World Champion in Austria would be the greatest thing on earth”, “says defender Katharina Lackinger. “A home World Championship is of course always something special, the players are well prepared and everything is fine. We want to take home a medal in the circle of the top nations, ” says Austria’s head coach Christian Zöttl about his own expectations. “The preparation for the World Championship went according to plan, we have a powerful squad with whom we can compete in the world class. With the home crowd supporting us we want to play our best. The motivation of the players in training is incredibly high. We will offer the Austrian audience a fight for every ball, the preliminary round with Switzerland and Brazil is a real test for us,” said national team coach Zöttl. “The team of the organizers, with clumsy help from volunteers and FBC Linz-Urfahr, transformed the school sporting ground into the ÖBV arena in less than two weeks and it’s great to see how all come together when things are getting serious.” Children can relax and play int the children’s area with a bouncy castle, speed measurement or a fistball tryout. The official World Championship Party will take place on Friday and Saturday after the games in the LUI at the University of Linz. An own center court for up to 2,300 guests was set up on the large event area, which was extended by a large food and drink court in the Fan village. On Tuesday and Wednesday the group matches will be played, an then on Thursday the Double Elimination mode start. On Friday and Saturday are placement games and half semi-final matches. Saturday will be the big World Cup final. ORF Sport + airs the two semi-finals, the match for third place and the final live.